Pluto: Smile - we are ready to snap your picture! If you are out and about in the morning of July 14th or you are sitting at home reading this article. At 7:49am Eastern Daylight Time, symbolically look up at the sky (please don’t stare at the Sun). At this precise moment, a machine built by humans will be making its closest approach to Pluto – at the frontiers of our Solar system. This spacecraft, New Horizons, has been traveling at the incredible speed of 50,000 km/hour (if you are not impressed, check your speedometer when you are driving on a highway and compare with this Pluto probe)! And yet, it has taken nine long years to get to Pluto. Don’t blame the spacecraft. Pluto is currently 5 billion kilometers away and even one of fastest spacecrafts ever built by humans has taken this long to get there. An American astronomer, Clyde Tombaugh, discovered Pluto in 1930. For the past 85 years, Pluto was seen as a small fuzzy object. Even the best telescopes could not make out much detail. In fact, four of its five moons have been discovered in the last ten years. In the last few days, however, Pluto has become a real world. Look at the photograph above. This is our best image of Pluto yet. 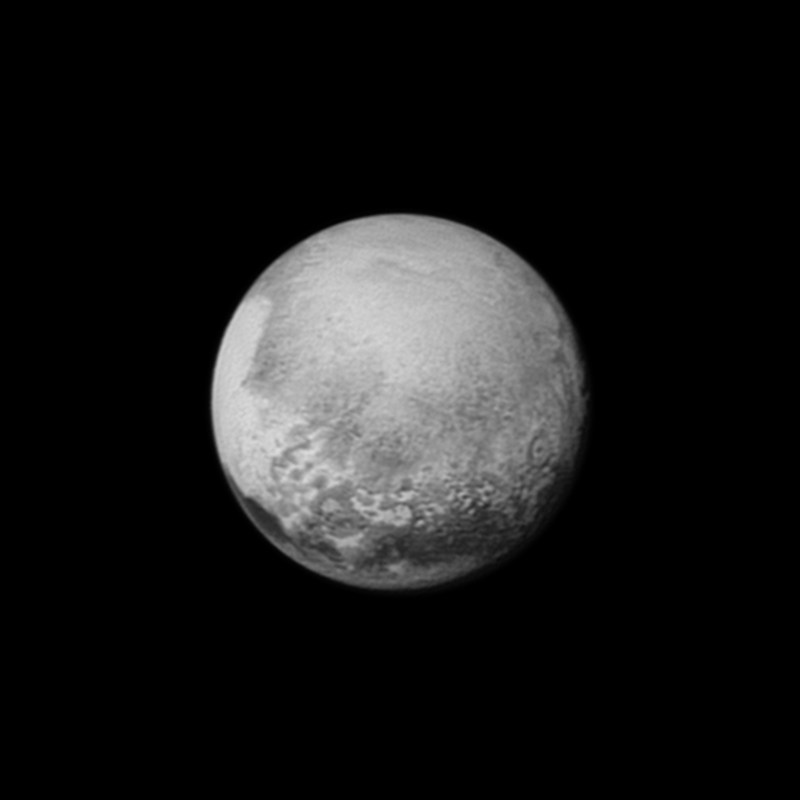 It was taken on July 12th, when the New Horizons spacecraft was 2.5 million kilometers from Pluto. We can already see a couple of craters on the surface, as well as some cliffs (see the annotated image below). But hold your breath. 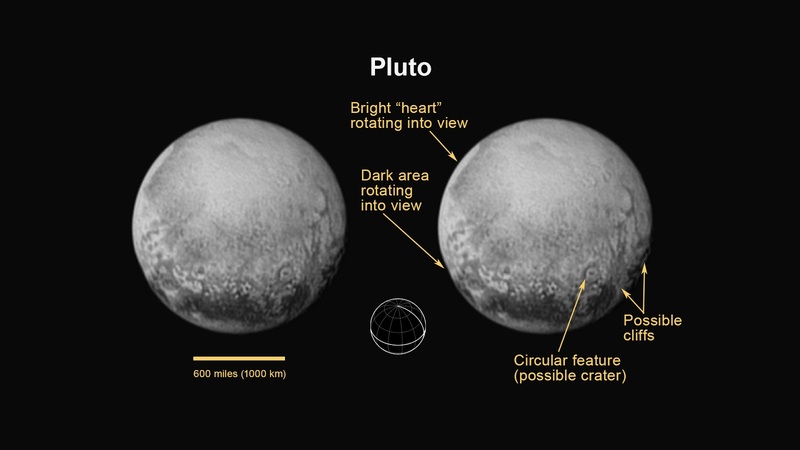 The spacecraft will take pictures of Pluto from a distance of only 12,500 kilometers – its closest approach. What kind of secrets will Pluto reveal then? Will there be ice volcanoes? Or evidence of sub-surface ocean? Or perhaps the spacecraft will find things that we have not even imagined about this cousin of ours living in the outskirts of the Solar system? Whatever it will be, it will be different and stunning. This is the lesson we have learned from explorations of eight planets and their moons. Until recently, Pluto was the ninth planet of our Solar system. However, in a contentious decision, its status was demoted to a dwarf planet in 2006. I have my own bias in keeping its status as a planet. I obtained by doctorate from the astronomy department at New Mexico State University in the US. Clyde Tombaugh founded this department, and I had a chance to meet him and to be present at his 90th birthday in 1996. He died the next year, but Pluto retained a special place for astronomers in our department. With the renewed interest in Pluto, I hope its status will be restored as a planet. 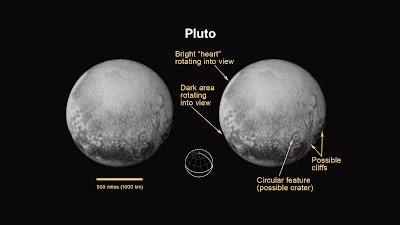 Once New Horizons flys past Pluto, it will take a picture of Pluto in the shadow of the Sun. An eclipse. This will happen at 8:51am Eastern Time. The goal of the image is get information about the atmosphere of Pluto. But this picture will also tell us that this machine built by humans, has successfully gone past one of nine major bodies in the Solar system. So today, at 7:49am (EDT), take a deep breath. Then look up in the sky and appreciate what humans can do at their best. Sir! When such pictures are published by the NASA why the stars are not visible? Is there any science phenomena?